Written by Matt Kingston for News4Jax. 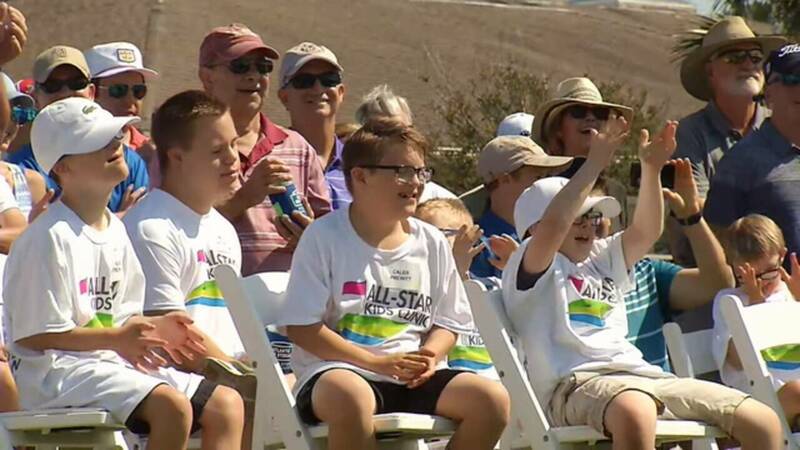 For the third straight year, the Tesori Family Foundation hosted their All-Star Kids Clinic. Michelle and Paul Tesori, who caddies on the PGA Tour for Webb Simpson, hosted dozens of special needs children at Sawgrass Country Club on Wednesday afternoon. In its third year, the smiles on the kids get bigger and bigger. But helping children with special needs isn’t just the focus of their foundation, it is a part of their daily lives. Their 4-year old son Isaiah was born with Downs syndrome and the Tesoris say that without him and his extra chromosome, they wouldn’t be doing this today. “He gave us a platform that wouldn’t have had. When he was born and we found out he had Down syndrome, we celebrated it and wanted to help other families. We have been given a lot of lessons in how to deal with it and we just want to spread it to other families,” said Tesori. Someone else very connected with the special needs community is Jordan Spieth. His sister Ellie has special needs and Jordan says he is her biggest fan. Jordan has helped at the clinic each of the three years it has been here and says he wouldn’t have it any other way. Spieth and the Tesoris both agree that there is just something in special needs kids that connects them to the game of golf. That something is what the all star kids clinic is all about. For more information on the Tesori Family Foundation and other events they host, visit tesorifamilyfoundation.org.